In the modern American Christian world, there are two major schools of thought about finding your life’s work. Both views have their proponents and books, and both have positives to commend them to you. The first view is that one needs to absolutely only ever obey God. The other view is that one needs to “find yourself” and go with the flow of the universe. This latter view is often Christianized by attaching random Bible verses. It’s also so much fluffy nonsense. The other view, of only obeying God, is a no-brainer. If you are a Christian, then you have made that your life’s goal: obey God in all ways and all things. One is then back to the original question: what do I do with my life? How do we find those things that we best glorify God by doing? 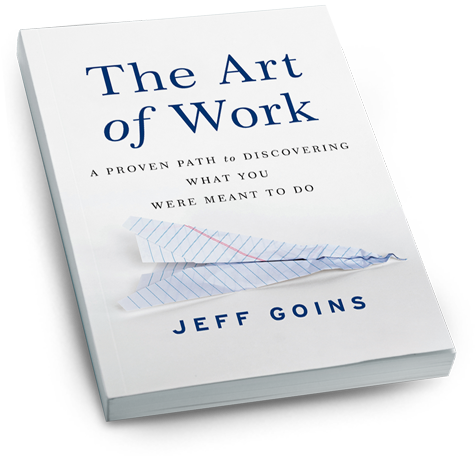 Into that conversation comes The Art of Work by Jeff Goins. Goins acknowledges the need to find personal fulfillment in work, but bases it not in self-satisfaction but in becoming what God meant you to become, doing what you were meant to do. A note is due here about the idea of “work” for the purposes of this book. It’s not just about where you punch a time clock. It’s about all the things we do—both for profit and for living. Goins presents some ideas here about how to help those two things mesh. Goins challenges the reader to examine just how they are energized in living life. He presents several ways to work through shifting life to a more fulfilling view. It all starts with the core: determine that what you want in life is not the same as what everyone else wants. Lean into those desires, not into the template of wealth or self-actualization that the world imprints for you. Is this work perfect? Of course not. For the most part, the imperfections are opportunities for the reader. Goins has chosen examples and testimonies that highlight the extremes that are possible in this world, both depths to rise from and heights to soar to. That many of us may not achieve as much should be balanced by the reality that most of us are not near as low, either. Further, if he spelled out exactly what you should do, you would live his dream and not yours. Seems like that misses the point, doesn’t it? All told, Goins makes excellent points in The Art of Work. Further, he uses Biblical events and passages without doing violence to their context. It’s not a Sunday School book—this is not a Bible study work, it’s a personal development book. But it is worth your time. Disclaimer? Not really. I’ve met the author, and he’s a nice guy. Of course, I’ve met other people whose books I don’t like, so meeting me doesn’t guarantee a good review. This is worth your time.